(Trent Nelson | The Salt Lake Tribune) One of UTA's Utah Valley Express (UVX) buses makes a stop in Orem, Tuesday Sept. 25, 2018. The Utah Transit Authority may have hit on a formula to quintuple its ridership: Offer service that is free and frequent. Such a fivefold increase occurred in the first month of its new Utah Valley Express (UVX), a bus rapid transit route in Provo and Orem — which, for now, is free for everyone and offers service every six minutes at peak times (and every 10 minutes at off-peak times). Those results came before the route is fully completed. The service started Aug. 13, but many of its stations are still under construction. Also, eventually half of its 10.5-mile route will have exclusive traffic lanes for buses — not shared with other vehicles. Most of those are also still being completed. And the route has yet to use priority control at traffic signals to speed it along. Even with all that, by the time Brigham Young University and Utah Valley University started fall classes, UVX had a daily average ridership of 9,213 trips, according to data obtained by The Salt Lake Tribune through an open-records request. That is five time higher than the average 1,863 daily trips carried during the past year in the same area together by bus routes 830 and 838. (Rick Egan | The Salt Lake Tribune) The new UTA Utah Valley Express (UVX), which will be part of UTA's newest bus rapid transit system (BRT) between Orem and Provo, is shown Wednesday, May 30, 2018. UVX began service Aug. 13. Hal Johnson, UTA’s manager of integrated project development, said UTA found when it started TRAX service years ago to the University of Utah, ridership grew for four years as older students graduated, and new ones were more likely to ride it — and base their housing decisions on where they could most easily catch it. UTA struck a deal with BYU and UVU to start providing transit passes this year to their students, faculty and staff — and in some cases, their family members. The agreement costs each school $1 million a year for 10 years and is expected to provide up to 100,000 passes annually. On top of that, a federal grant is allowing free fare on just UVX for three years for everyone else. De La Mare-Schaefer said, “A ride for free encourages people to take the low risk and try it” and perhaps get in the habit of using it. Johnson said early data suggest that beyond student use, local residents are riding for shopping and recreational trips. De La Mare-Schaefer said she personally believes that frequent buses are even more important to attracting riders than free fares. “Just the convenience of always knowing a bus is coming makes a big difference in your planning,” she said. Even with the quintupling of riders, UVX has yet to reach the 11,328 average daily rides at opening that UTA forecast would occur when it was being planned and seeking federal funding. De La Mare-Schaefer said ridership should increase once the project is truly finished and is able to cut its travel time. Also, the early numbers do not include rides for big university events, such as BYU football games. She said that should also bring up numbers, perhaps even beyond projections. Also, she predicts that as time goes on and more people become aware of the free and frequent service, ridership will increase. Andrea Packer, UTA communications director, said UVX “will be a good case study for all of us to learn from” regarding how free fares may affect ridership — and whether they should be offered elsewhere. Local bus systems in Park City and Cache County now are entirely free-fare, for example. 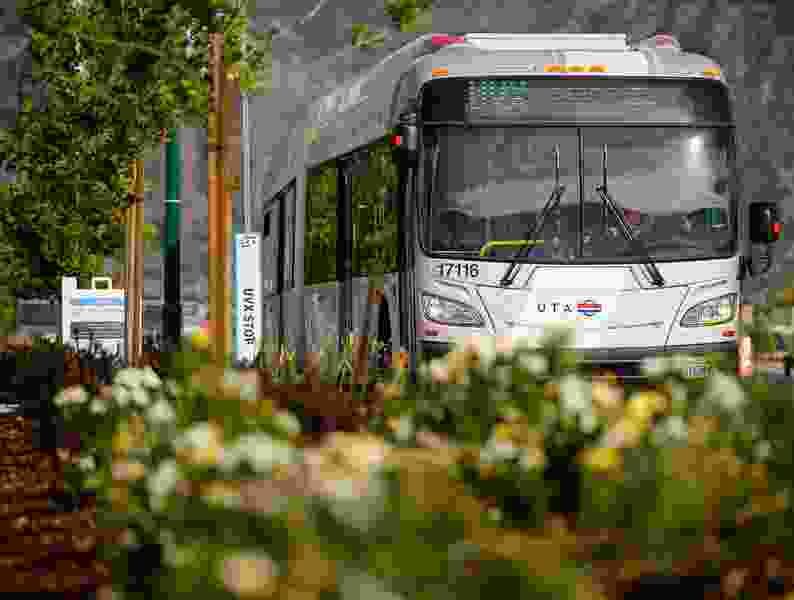 (Rick Egan | The Salt Lake Tribune) The new UTA Utah Valley Express (UVX), part of UTA's newest bus rapid transit system (BRT) between Orem and Provo, is shown Wednesday, May 30, 2018. She said that comes, in part, from tracking where BYU and UVU students use their passes to “tap on” electronically for service. UVX has been controversial. Resident groups sued unsuccessfully to stop it, arguing, among other things, that it would have low ridership and would complicate traffic flow for other vehicles. It also had an $11 million cost overrun beyond its initial $190 million price tag because of higher-than-expected bids and land costs. Still, the UVX was much cheaper than building a TRAX line. In 2011, the mid-Jordan TRAX extension covering an equal distance cost $535 million. A bus-rapid transit line operates almost like a TRAX line. Customers buy tickets before they board. It has extra doors and limited stops. Buses are longer than normal — 60 feet instead of 40. And much of their travel is in bus-only lanes to speed service. UTA has more than 200 miles of additional bus-rapid transit lines in future plans, including through Davis County to Salt Lake City, from downtown Ogden to Weber State University, and from West Valley City through Taylorsville to Murray. Stops on the UVX include the Orem FrontRunner Station, UVU, University Mall, BYU, the LDS Missionary Training Center, downtown Provo, the Provo Town Centre Mall and the Provo FrontRunner station.